Writing takes commitment and creativity makes it fun. No matter what you want to write, having the practice of writing and publishing short devotionals can sharpen your writing skills. Spring is a great time to plant the seeds of devotional writing in your heart. This can become a rewarding spiritual discipline, an outreach for sharing your faith with others, a practice method for writing skills that improve constantly and an effective way to build your readership relationships. Familiarize yourself with various devotionals. Read online devotional publications and printed publications. Identify the ones that appeal to you. If you enjoy the publication as a reader, you are likely to relate well to the audience. Read any submission or writers guidelines. Make note of deadlines and the submission process. Establish a regular schedule for working on your devotional. Keep a file or notebook with ideas that you find throughout the day. (If you need to rely on these notes, make a practice of finding something to put in this notebook or file everyday so there will be water in the well when you need to draw from it). Start your writing time with prayer and invite the Holy Spirit to inspire you and work through your writing to build God’s kingdom. Select a scripture or idea from your items collected in number 2 and brainstorm for a few minutes. Create a rough draft that captures some emotion or experience that helps you connect with the reader. Edit, revise and proofread your devotional. It helps at the final stages to share it with others and get input or at least help proofreading. Send it in to the Next-Step-of-Faith or the publication of your choice. Be sure to send items before deadlines and follow the guidelines for submission. Tell everyone you know about the article you have on line when it is published. Mention it in your blog, newsletter or any other communication tools you already use to get the word out. Start today with your new writing habit of devotionals. 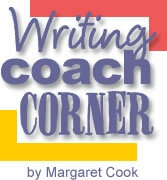 Copyright © May, 2008 – Margaret Cook. All rights reserved.